Another day in Mayberry, Jamie Moore thought as she waved the last two customers of the day out the door of the Chocolate Bar. A gust of autumn wind slipped in as the old women left, tickling the chime hanging in the window: little chocolates nesting in pretend paper cups dangling from a pink, heart-shaped chocolate box. They looked good enough to eat, just like the vast array of temptation Jamie kept on trays behind the glass counters. Except Jamie's truffles and fudge and other chocolate concoctions weren't simply good enough, they were great, to die for. That was what all her customers said anyway. Jamie watched through the window as the two women started their snail--paced progress down the sidewalk, the late October wind whistling under their skirts. On the other side of the street another gust playfully stripped blushing leaves form the big maple on the corner. They danced off, swirling onto the sidewalk. The swirling leaves made Jamie think of fairies, and that made her smile, something she'd done a lot lately. Maybe it was Heart Lake, maybe it was the magic of chocolate - whatever it was that she'd found here, it had given Jamie back her smile. Her struggles in L.A. were behind her now and she had a new business and a new life. She had come home, stepped back in time, and found herself again. Jamie hadn't found a fortune, though, at least not yet, so that meant only part time help, low-rent living and a beater car. But the low-rent was on a lake front cabin that her aunt, Sarah Goodwin, h ad found for her. and the beater was a Toyota that gave her great gas mileage. So it was all good. She turned the sign on the door to Closed, then hurried through her closing chores, cleaning the espresso machine, wiping down counters, and washing dishes. Her final chore was to jot down her grocery list. She bought her chocolate from a supplier in Seattle who had it shipped from France, but for her other supplies she shopped locally. Tonight she needed to get cream, a necessary staple for really good truffles. She also needed some more strawberry liqueur, which Tony at Bere Vino was holding for her. Tomorrow she'd be in the shop by five, making more chocolate creations. Her part-time help would join her at ten and man the counter. Wednesdays were always busy thanks to a walking group, the local MOPS moms who came in after their weekly meeting, and Lakeside Realty, who held their realtors' open houses every Wednesday and put out a plate of her treats. And that was only the morning customers. Just thinking about tomorrow made her tired, but that was nothing compared to how tired she felt when she thought of Fridays, when half of Heart Lake came in searching for hostess gifts, shower presents and a little something to help them celebrate TGIF. Tired is good, she reminded herself, it means your business is growing and you can pay the rent. By the time Jamie stepped outside and locked the chocolateria door behind her those gusts of wind were spitting rain everywhere. Look at all the cars parked out here, she thought, surveying Valentine Square as she prepared to make a dash to her Toyota. Who'd 'a thunk it? When she was a kid, downtown Heart Lake had been a slow, lazy place, with an occasional old lady browsing a few shops on a long stretch of cement. Vern's Drugs, with its narrow aisles and slightly off-kilter hardwood plank floors, had been the popular destination spot for friends in search of some gossip as well as kids on the hunt for penny candy. Vern's still occupied the same spot on downtown Lake Way, the main drag, but now it was crowded on all sides by new shops. And the downtown district had spilled over into nearby streets like this little u-shaped one, where her shop sat along with a card shop, a jewelry store, a lingerie shop (of course, they'd all chosen Valentine Square on purpose), and an old brick two-story Tudor that housed a divorce lawyer on the ground floor and a romance writer on the top. This street wasn't too crowded, but Lake Way was getting ridiculous. When Jamie had gone to Vern's the week before looking for aspirin she'd had to park clear at the end of the street. Just two quick stops, she promised her tired self as she drove up Alder, headed for Lake Way. then she could go home and snarf down the leftover lasagna Sarah had sent her away with after their dinner together the night before. Poor Sarah. Tomorrow her daughter left for the East Coast. She'd be ready for a chocolate bender when they got together after work for their weekly confab with Emma Swanson. At the four way stop where Alder intersected with downtown Lake Way Jamie found herself in a mini rush hour. "What's this?" she muttered. Cars never used to line up for this stop sign coming even one direction, let alone four. The car conga line inched toward the stop, each driver reaching the intersection and barely waiting for the next in line to slip across before jumping his or her vehicle forward like a racehorse out of the gate. And there stood her two little old ladies, clutching their Chocolate Bar goody bags and hovering over the crosswalk, afraid to put out so much as a toe. The short, plump one clutched her wool coat tight to her chest and huddled next to her friend as if for protection. Some protection. That woman was taller, but her legs looked like matchsticks. Her thin lips puckered in a frown and she was holding her felted hat down like she was afraid the back draft from some rushing car would whoosh it right off her head. Jamie got that everyone was anxious to get home for the night, but couldn't somebody spare even a minute to let the old ladies cross the street and get out of the rain and back inside their senior housing? If they were still stuck on the curb when she got to the stop sign, she would. Four more cars bolted across the street and the women remained rooted to the corner, looking uncertainly at the passing vehicles, probably thinking they'd never see Senior Gardens again. Jamie pulled up to the stop and waved them across. They stepped out nervously, linking arms and looking right and left at the other cars, probably mentally begging the drivers not to squash them. Once in the crosswalk they hobbled for the other side like contestants in a slow motion three-legged race. After a millennia they safely reached the corner. The plump little one smiled at Jamie and blew her a kiss. She smiled back and waved. That had felt good. And it only took a minute to be nice. People should always be nice. She started to take her turn only to have a red Mustang holding two high school Britney Spears wannabes bolt across the street right in front of her, gobbling up her warm, Good Samaritan moment with a squeal of their wheels. "Excuse me?" Jamie laid on the horn and one of them flipped her off. Well, of all the . . . She caught sight of their bumper sticker All you need is love. "And driving lessons," she muttered. What a couple of beatches. Oh, well. Every town had 'em, probably even Mayberry had one or two. Somewhere. Hiding off camera. 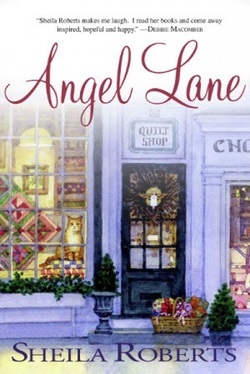 Angel Lane is available online and in local bookstores.